Vishnu Viswanath, 29, and Meenakshi Moorthy, 30, fell to their deaths from Taft Point in US' Yosemite National Park. In a tragic incident, an Indian couple died after falling 800 feet in an area with steep terrain in California's Yosemite National Park this week, according to a media report. Vishnu Viswanath, 29, and Meenakshi Moorthy, 30, fell to their deaths from Taft Point in Yosemite National Park. They were identified on Monday as a married couple from India living in the United States, the San Francisco Chronicle reported. The report said that the couple had recently moved from New York after Vishnu Viswanath took a job as a systems engineer at Cisco, based in San Jose. Together, they chronicled their adventures of travelling around the world in a blog called 'Holidays and HappilyEverAfters'. Rangers recovered their bodies on the steep terrain on Thursday below Taft Point, a popular tourist spot that offers spectacular views of the Yosemite Valley, Yosemite Falls, and El Capitan. Visitors had spotted the bodies a day earlier. Investigators were looking into how the couple fell or what had occurred when the accident happened at the famous spot which is a favourite place for tourists from around the world to take scenic and memorable photos. Earlier, the National Park Service had said in a statement that the recovery operation for a male and female visitor who had died in the fall from Taft Point was completed on the afternoon of October 25. The department said the two people fell approximately 800 feet below Taft Point in an area with very steep terrain. The report added that the couple had been married since 2014 and both were software engineers. 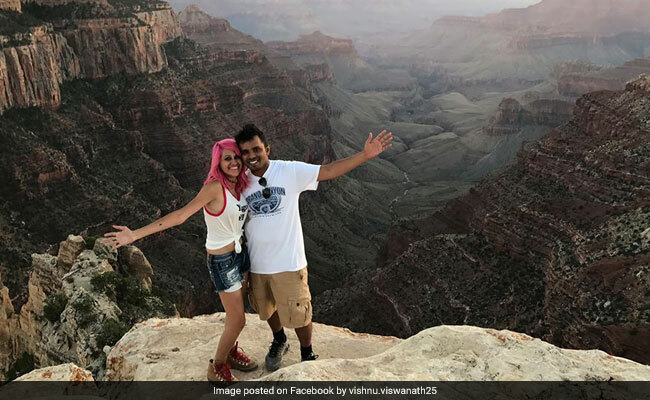 On the cover of Vishnu Viswanath's Facebook page is a picture of the two of them smiling on the edge of a cliff at the Grand Canyon. In a Facebook post, College of Engineering, Chengannur said the two were its alumni and added that it deeply mourns their "accidental demise". The college said Vishnu Viswanath and Meenakshi Moorthy belonged to the BTech 2006-10 Computer Science and Engineering batch. Raj Katta, 24, of New York, said he got to know both of them while attending Bradley University, in Illinois. He said Vishnu Viswanath was a "thoughtful and amazing guy, very talented. They are a really happy couple. Very positive." Mr Katta described Meenakshi Moorthy as extremely positive and enthusiastic. "She's one of those girls who wants to explore the world and discover a deeper meaning in life."